One of the things I like best about London is its landmarks. The Gherkin is north of the Thames and close by our flat. It's also a quick visual reminder should we need to get our bearings. The photo below was taken as we walked across the Tower Bridge toward the south side of the Thames. We've also checked out three markets. Leadenhall and Spitalfield are located north of the Thames. 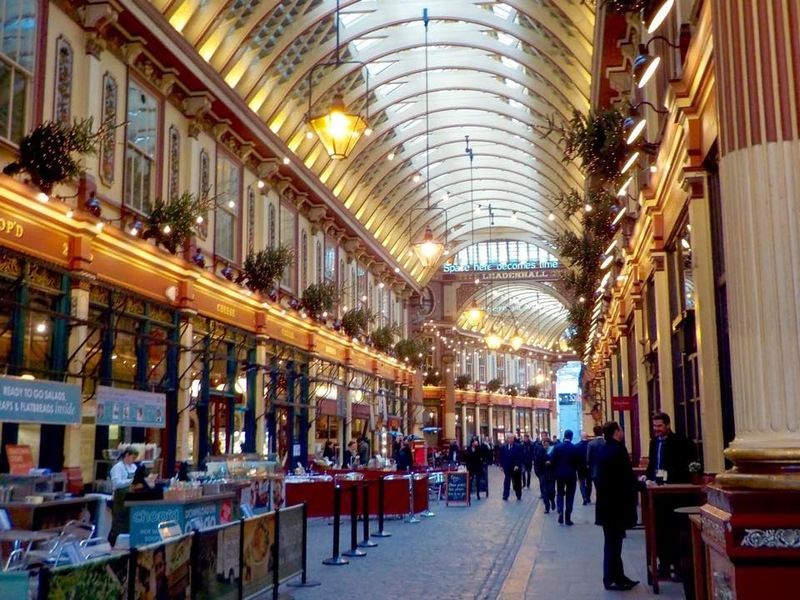 Leadenhall Market dates back to the 13th century and is situated in what was the centre of Roman London. Spitalfield Market is the city's oldest market and open seven days a week. We arrived a few minutes before 10 AM so we wandered around while the vendors set up their stalls. In close proximity to the market is this high-rise building. When it was being build in the 1990s workers discovered a Roman wall beneath and rather than remove it incorporated it into the architectural design of the building. Directly out front of the main entrance is a stairway leading down to the glassed in Roman remains. The entire structure seemed to sing in the wind and when we went to investigate we realized we could walk inside it. Crossing over the Tower Bridge we stopped to take a gazillion photos and sometimes were asked by other tourists to take their photos with the city scape in the background. Or a Christmas Market in front of the Tate Modern and Millennium Bridge. Borough Market is actually halfway between Tower Bridge and the Tate Modern. It did not have the glitz and glamour of the other two markets, but it was my favourite because it was ALL food. The aromas were tantalizing and while there were foodstuffs from around the world, there was no shortage of British cheeses, meats and breads. Seeing and smelling all of that food made us hungry so we stopped for lunch at Doggett's Coat and Badge Pub. John had Lamb Pie (see the bone sticking out from the pastry) while I ordered the Venison and Ale Pie. Delicious! We headed back to our flat via the Millennium Bridge. St. Paul's Cathedral in on the north side of the Thames and One New Change is a shopping mall across the street from the cathedral. It's 6th-floor Rooftop Terrace provides spectacular views of the city. If you look closely you may be able to spot the London Eye on the left in the distance. On the elevator ride up I overheard one man tell his friend the terrace was "one of London's hidden gems" as few people are aware of it or that it's free. The window 'wall' to the left (above) houses four sculptures that pay homage to the city's Roman roots. There is also a terrace garden mosaic. Also atop the terrace is a restaurant with inside or outside dining and a separate bar (shown here with the red roof). All in all a great couple of days in London. Next? Not sure, but stay tuned!